Many agricultural traditions in the Harput/Kharpert region are probably as old as the long-standing Armenian presence in its villages. Certain methods of grinding and crushing wheat, spinning cotton, and weaving date back centuries. Relatively newer agricultural knowledge, like silkworm culture, was later acquired and rapidly spread through certain villages of Harput. A quick survey leaves the impression that the crafts in Harput were intricately connected with what the cultivated land of the region could produce. These crafts came to address, first and foremost, the villagers' domestic needs, like the preparation of bread, bulgur, and clothing. Yet, it is clear that the locals advanced their expertise in these crafts which were passed on from generation to generation explaining why their products were in such high demand in the markets of the region—most importantly in the cities of Harput and Mezire (Mamuretül-aziz). Production in this region included items that could be traded and sold. In addition to excelling in agricultural production, the villagers were distinguished cobblers, masons, and engineers. Such craftsmen were present in most villages of the Harput plain, and the villagers were renowned for their work. 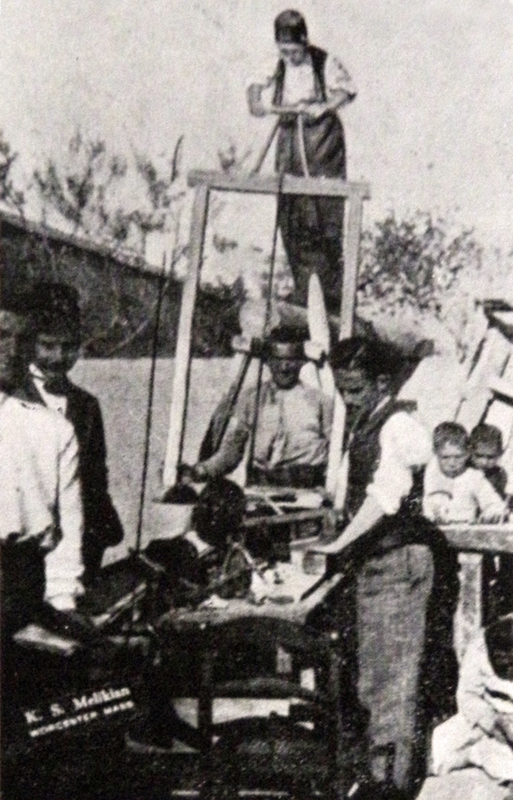 Shoes produced in the villages were sold in faraway markets, and the masons and engineers of the villages were often invited to nearby cities to take part in the construction work. Needless to say, the city of Harput itself—having been surrounded by such productive villages—was a formidable center of crafts. For a long time, the city stood as the main market for the villagers, who came to primarily purchase agricultural tools. 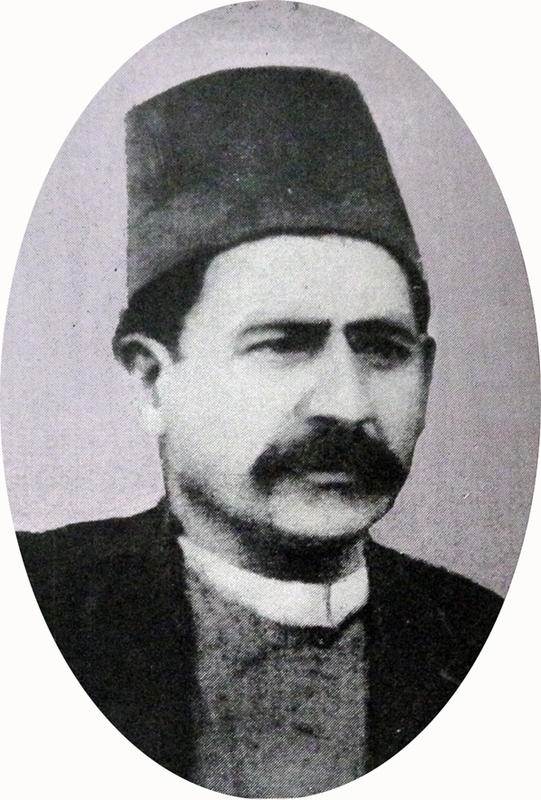 Beginning in the second half of the 19th century, however, Harput ceded its central role in the region’s trade to Mezire, which was declared by the Ottoman authorities as the province’s center and renamed Mamuretül-aziz. This newly ordained center for trade experienced rapid development, population growth, and great economic prosperity. 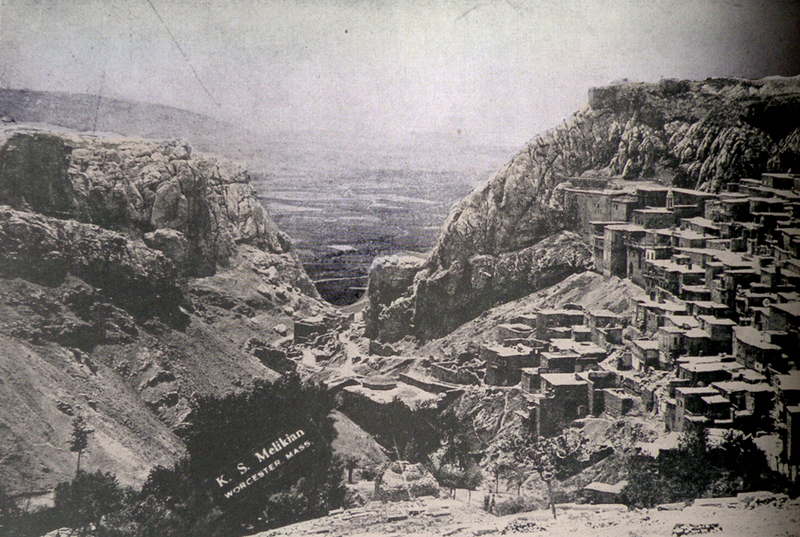 Harput and Mezire were two neighboring cities that operated as regional hubs for crafts. 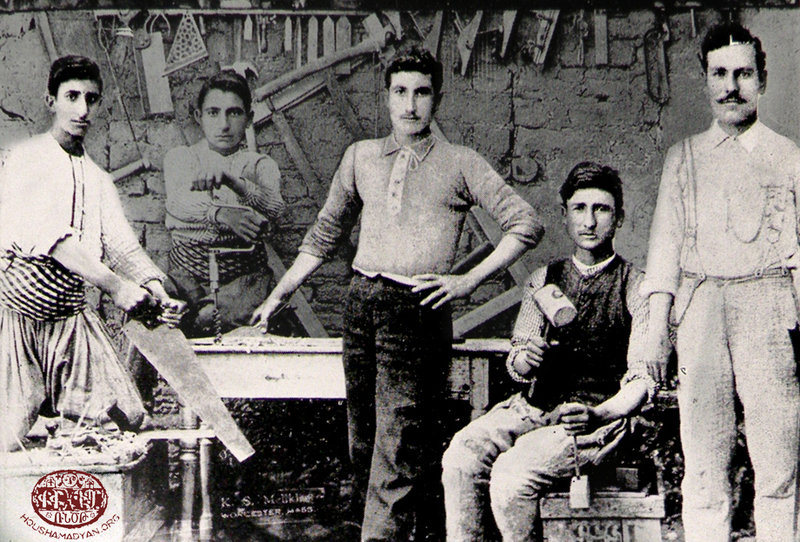 Until World War I and the deportations and massacres of the Armenians, the crafts of the region were primarily in Armenian hands. Both centers stood out with their industrial dynamism. As the example below illustrates, the craftsmen of Harput and Mezire had creative minds, which contributed to the further development of their productivity. After all, the master craftsmen of Harput succeeded, despite the material limitations, in establishing factories and giving industrial scope to their productivity. The existence of silk, cotton, and iron factories were not accidental, and attest to the multi-faceted skills of the craftsmen. It is worth delving further into this phenomenon: What accounts for the outstanding talent of the Armenian craftsmen of Harput? Undoubtedly, one explaining factor is the centuries-old experience that Harput Armenians had acquired in certain crafts. Weaving, for example, was considered the expertise of the local Assyrians. It is likely that their mastery was the legacy of centuries-old traditions of weaving. The same can be said about the crafts of the Armenian masters. And beginning in the late-19th century, a new dimension - emigration - was added to this. 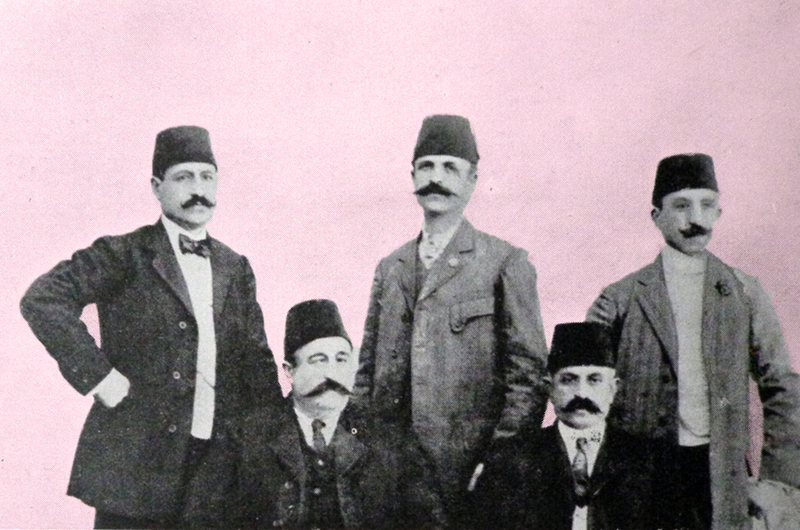 Social, economic, and political factors compelled many Harput Armenians, especially men, to leave their native city or village and settle in the more prosperous Ottoman cities like Istanbul or Adana. The skilled locals were essentially looking for a more conducive environment to work and make a living. 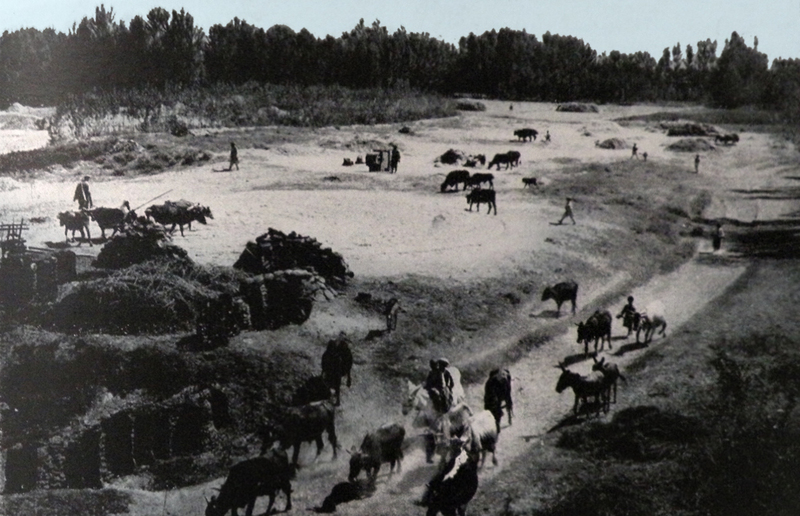 In their native villages, the reign of the local beys and aghas, as well as the absence of state structures, had often given way to injustices and abuses, and the main victims of these actions had been Harput’s Armenian farmers and craftsmen. The Harput Armenian thus moved to cities that were developing faster, hoping that the more palpable presence of the Ottoman central authorities in those metropolises would better shield him against injustices. Later, waves of emigration drove Harput Armenians to the United States, where most started working in industrial cities. Emigration's negative impact was undeniable. Often, the emigration experience did not live up to the men's expectations or they did not always succeed in the big cities. Other times, members of the emigrant’s family also left their villages to join him. Thus, the Armenian-populated villages of Harput started emptying. 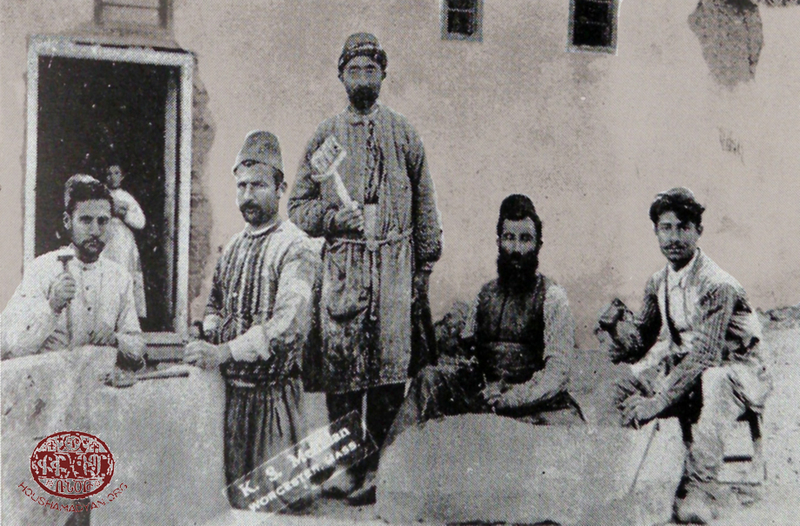 In yet other cases, the host cities became a source of acquisition of new industrial knowledge for the Harput Armenian men. Working in factories, they learned to operate new machines, and realized the usefulness of these machines to the crafts practiced back home. New knowledge bred new ideas and entrepreneurship. Some returned to Harput, Mezire, or the surrounding villages having acquired vast experience and knowledge. Their return can be considered a significant contribution to the local economy, as well as to the Ottoman economy as a whole. Ironically, local Ottoman officials viewed the return of Armenian entrepreneurs to their native cities and villages with suspicion. The case of the Parigian brothers, who opened the first foundry of Harput is very telling in this respect. Instead of encouraging the operation of this gem of a factory, the local authorities over the years impeded its operations in various ways and closed it down on many occasions, fearing that its owners would secretly produce arms for Armenian revolutionaries. The Great Market of Harput occupied a central part of the city. The primary craft here was cobblering, and most cobblers were Armenians. They worked in more than a hundred workrooms, each with four to five craftsmen. The entire area was called “dikindjinots,” from the Turkish root-word dikici, which means shoemaker (goshgagar in Armenian, or goshgar in the local dialect). The entire area was covered by small, low-ceilinged shops, with a tiny window above to illuminate the workroom. Vodits (odits in the local dialect) or postal: These were simple and low shoes with a protruding heel tab that resembled a tail. The heel tab was pulled up when putting the shoes on. The vodits was generally worn by men. Djizme (mouyg in Armenian): These were winter half-calf high boots. They were generally worn by teenagers. Adults wore them during travel. Djizmes were generally red or black. 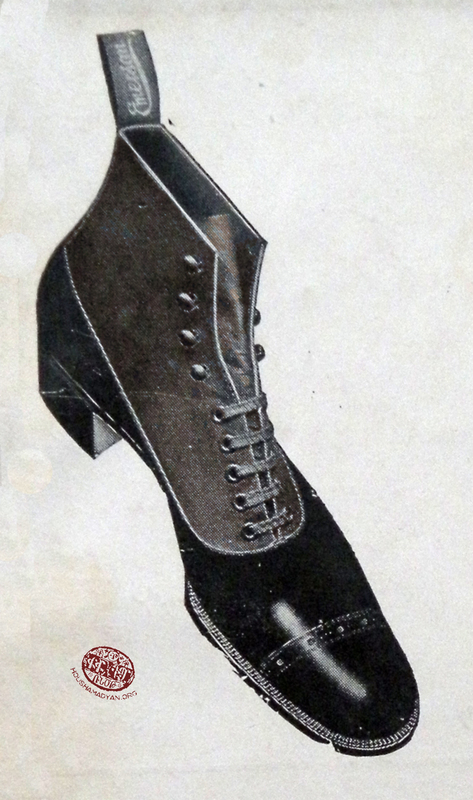 Kondura (also called potin, which may be the corrupted version of the French word bottine): These shoes exhibited more refined craftsmanship, and were also called European shoes. Only in the second half of the 19th century did the production of these shoes begin in the Harput region. 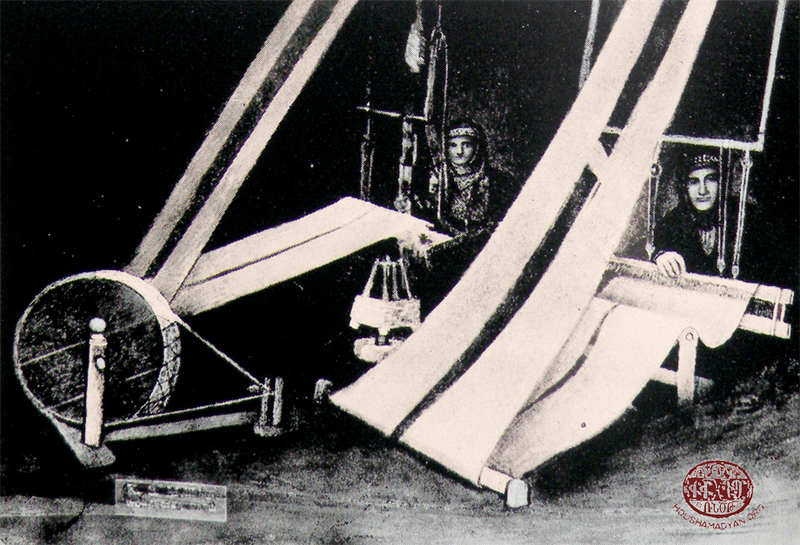 According to Djizmedjian, a Greek man named Gurzi introduced this craft to Mezire in the 1850's. 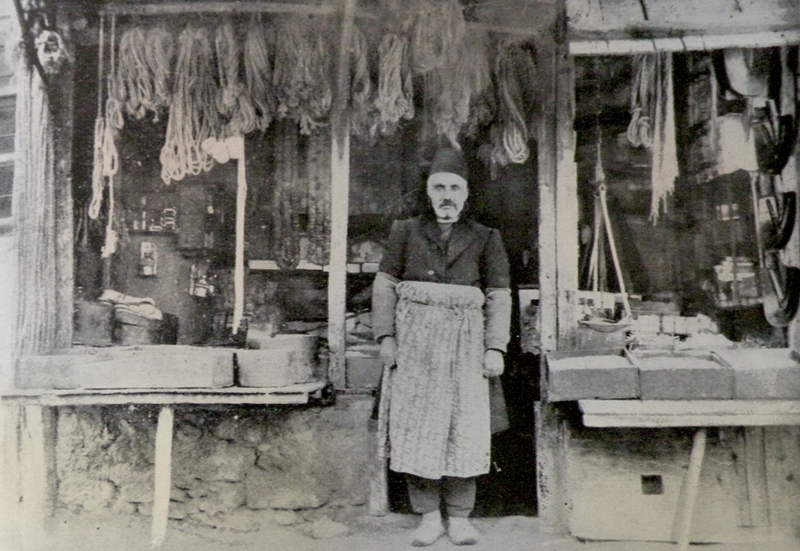 He opened a shop in Harput and took Hovagim Parichian as his apprentice. The latter mastered the craft of making konduras and, in turn, opened a shop with his son Smpad in the city. In 1895, Smpad emigrated to the United States, only to return after some time, bringing with him molds of new American shoes, samples, and tools. The production of konduras thus received a new boost. Initially, mostly the wives and daughters of Turkish and Kurdish aghas and beys wore konduras. After some time, women from the affluent Armenian families also started to wear them. Beginning in the 1890's, these shoes became more commonplace and we saw teachers, men with university education, and Armenians returning from their travels to the United States, wearing them. Konduras thus became the symbol of a particular social class. To make konduras, cobblers needed wooden molds that were imported from other cities although some local woodworkers made molds as well. The kondura was very popular especially among women. Kurdish women loved having special engravings on their konduras. Gradually, they become the most popular footwear for both men and women. They were also the most expensive shoes produced on the Harput plain. 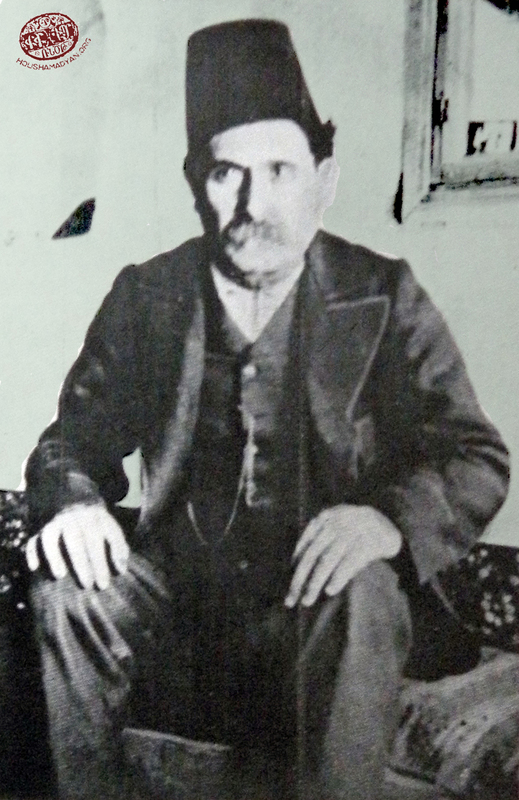 In the village of Parchandj/Perchendj (currently Akçakiraz) in the early 20th century, a pair of konduras were worth 25-30 kurus, and children’s konduras 7-8 kurus. A specific type of kondura, called botin-kalosh—likely the corrupted version of the French words bottine and galoche—was also produced during this period. This dual-purpose footwear had removable shoe tops that turned it into low shoes which could be worn indoors. 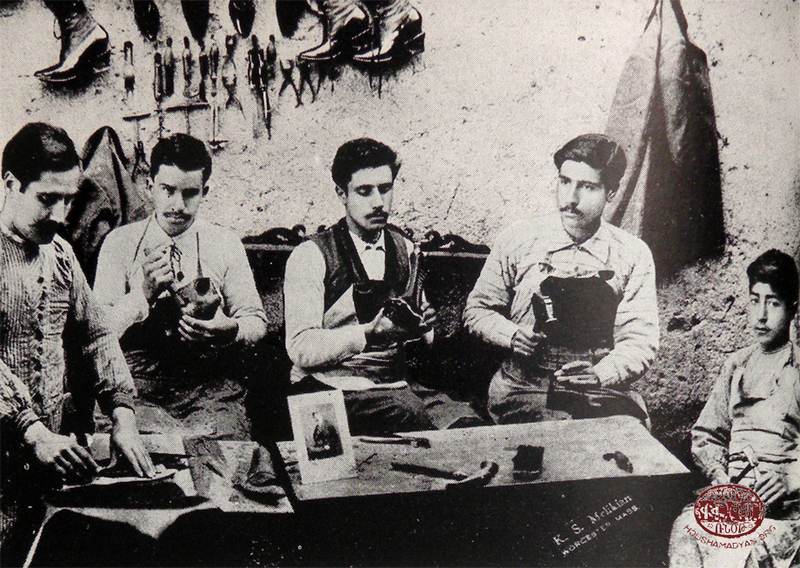 Master cobblers in Harput included Krikor Soghigian, Smpad Parichanian, Hadji Khacher Derderian, Mardiros Tashjian, Hovhannes Pambukjian and brothers, A. Altebarmakian, Asdur Liuledjian, A. Nalbandian, Mardiros Baghdigian, and Krikor Kazandjian. 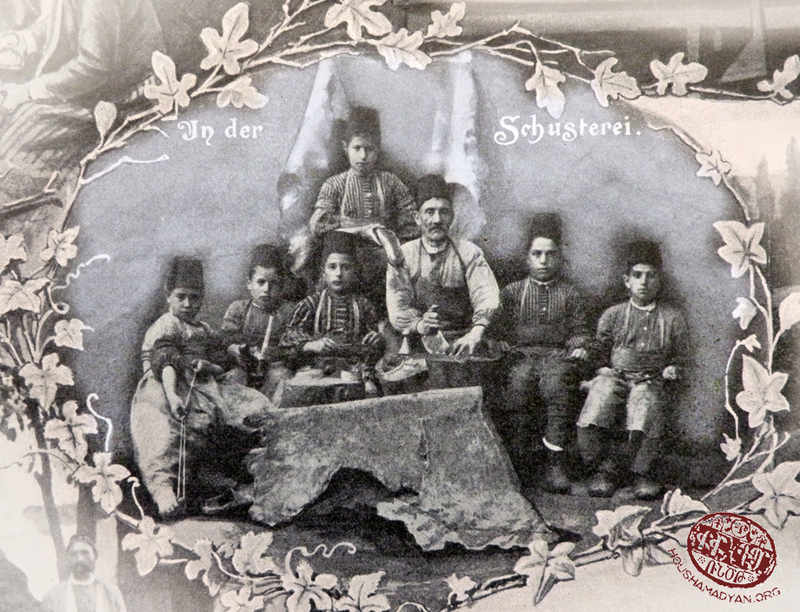 In Mezire, Sarkis Boyadjian, Khoren Darakdjian, Hagop Tashdjian, Melkon Rsdigian, the Ashdjian brothers, Hagop Djanigian, Khayadjan Srabian, and Sarkis Nurigian were well known. In Hussenig, Pilibbos Deroyan was a prominent master konduradji (kondura-maker). Charukh or charekh (drekh in Armenian): This was considered the most basic type of shoe made by cobblers. It was made of thick leather, with holes through which a thick leather string crisscrossed to tighten the charukh to the feet. These shoes were best fitted for work in the fields and in factories. 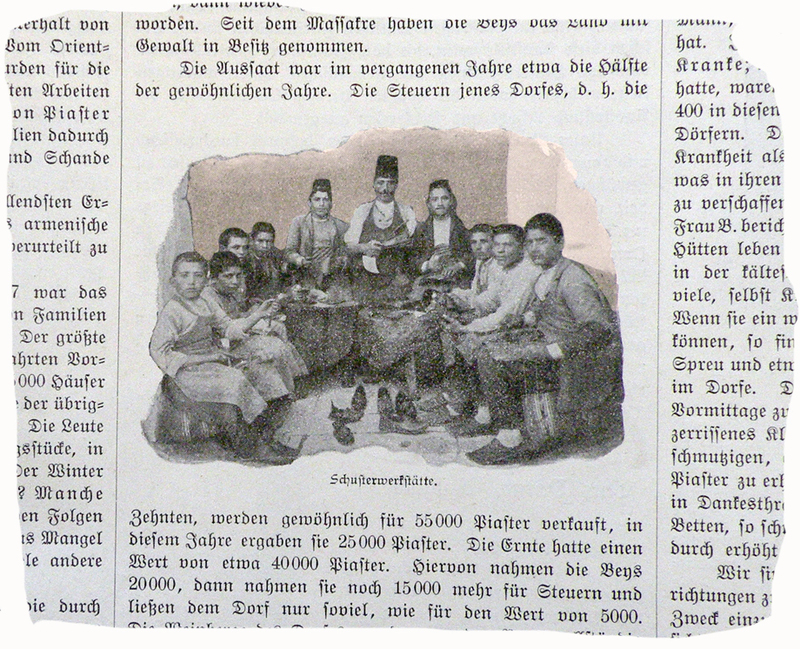 There were also pabudj (slippers) makers in Harput. These were primarily worn indoors by women. Learning the craft of shoemaking took two to four years, during which time the apprentice worked for his master without compensation. Master cobblers generally had one or two apprentices. 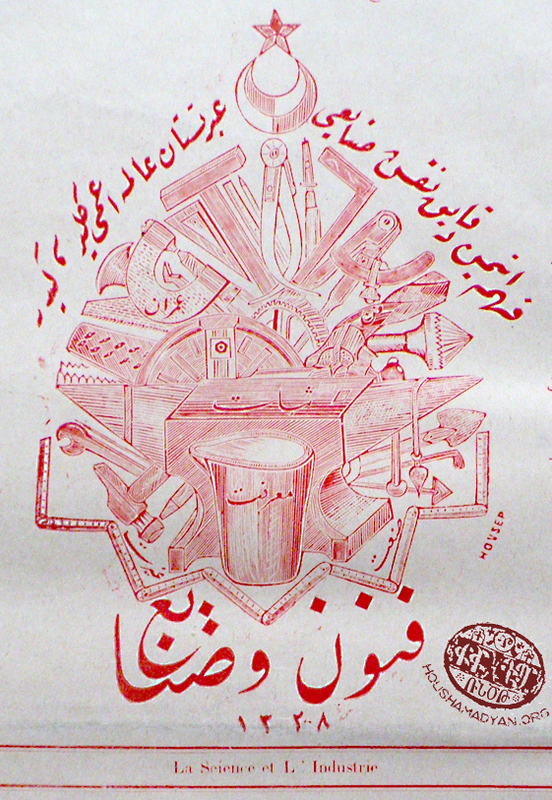 The goshgar’s tools were the cobbler’s ilig, tongs, the külek (wooden bucket), the akhtar aghadji, the masat (steel for sharpening knives), a wooden block, the tabar (leather-weaving tool) the khoval, the kaz (meaning goose in Turkish, names probably for its shape), the mushda (metal instrument used by shoemakers for pounding and smoothing seams), and the chakadjag (puller). This craft was practiced mainly by Armenians. The lumber would be brought from the villages of the Harput plain or from Malatya. The master carpenters of Harput and Mezire, as well as of Hussenig, Habusi (currently Ikizdemir) and Telgadin/Khuylu (currently Kuyulu), were most prominent. The carpenters generally made objects commonly used in everyday life, like furniture or boards for the construction of houses. He also made agricultural tools like carts, djerdjer (the tool used to separate cotton from its seeds), weavers, and the wooden parts of different tools and machines, etc. The carpenter’s tools included the adze, the drill and the drillbow. 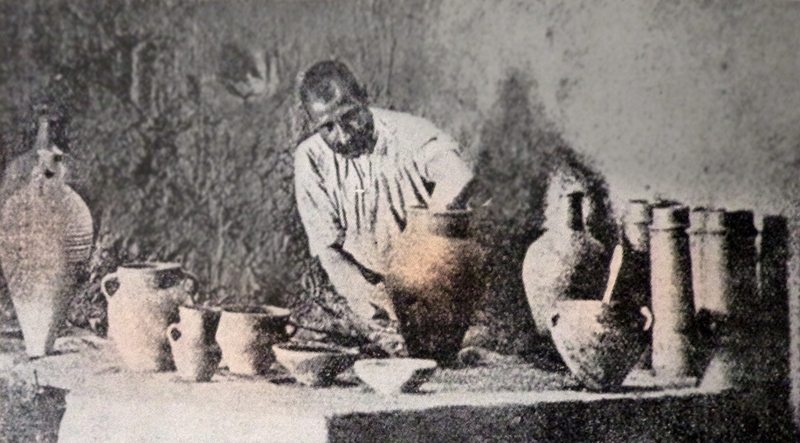 In the Harput and Mezire region, this craft too was controlled by Armenians. A distinction however was made between blacksmithing and locksmithing. The former was what is known as demirci in Turkish and made tools for construction and agriculture. The raw material used by the ironsmith was imported to the Harput region in the shape of long rods. 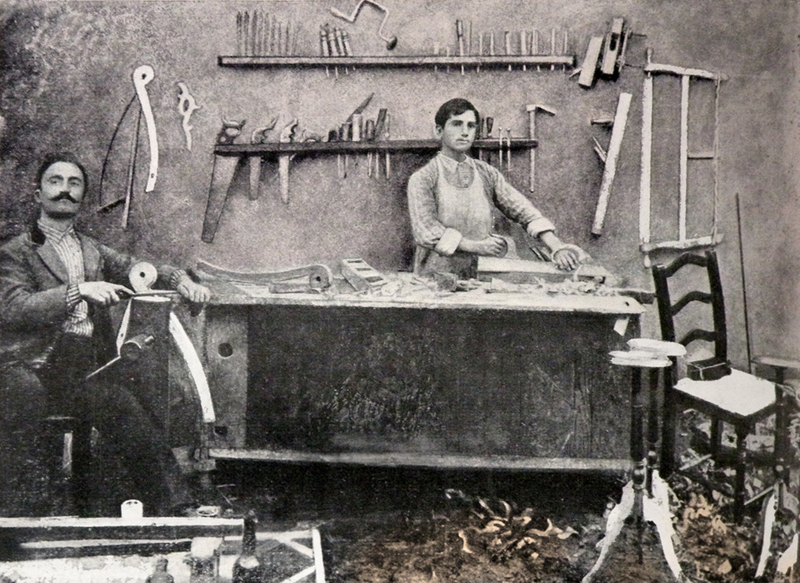 The locksmith, or the çilingir, made more refined tools and items like locks, scissors, knives, razors, and strollers. 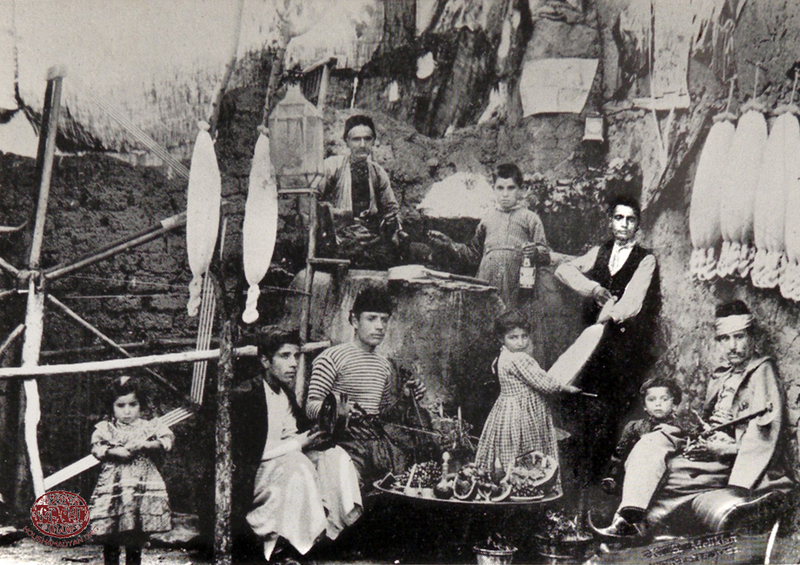 The Parigian family occupies a significant place in the history of blacksmithing in the Harput area. 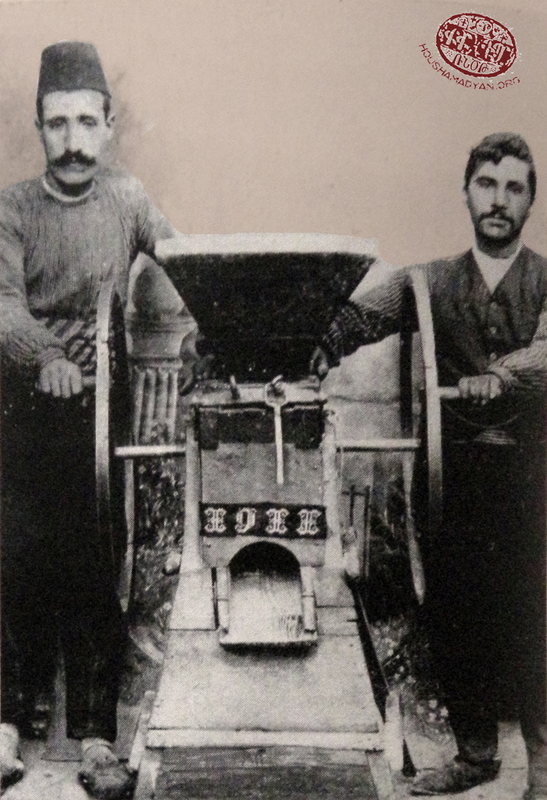 They were renowned for the foundry they established in Harput, which produced machines for mills, weapons, drillers, agricultural tools, and machines that separated wheat from chaff. 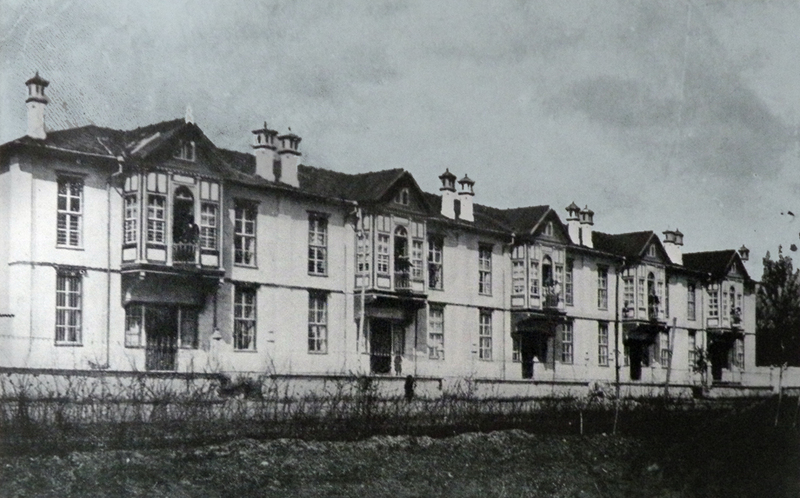 The factory was established by the brothers Apraham (b. 1839), Parichan-Ded Amu (b. 1841), and Manug (b. 1857) Parigian, who were from Hussenig. Apraham was a gunsmith, and Parichan a goldsmith. They became blacksmiths in 1865. 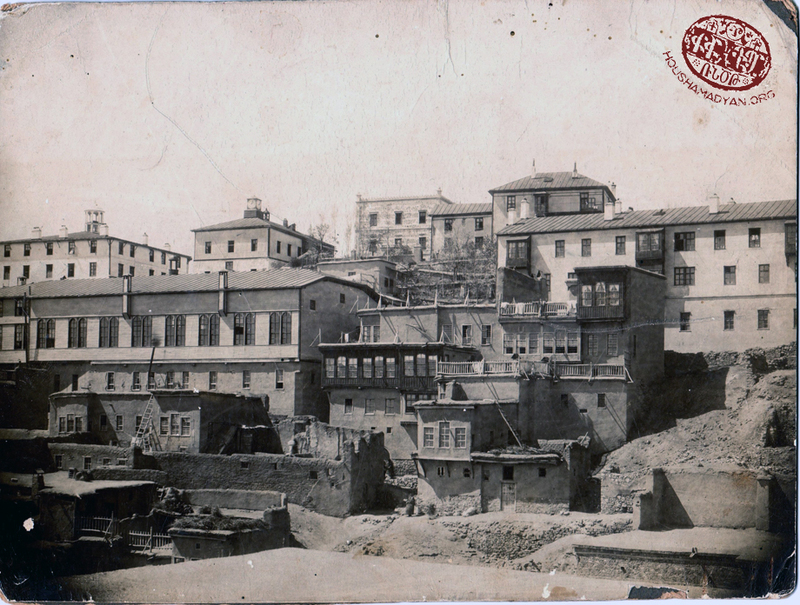 In 1870, the brothers opened a foundry in the Sinamud neighborhood of the city, in a valley bordering Hussenig. The location was a rocky, steep valley through a stream ran. The ingenious Parigian brothers were able to harness the energy from the stream to operate their machinery. 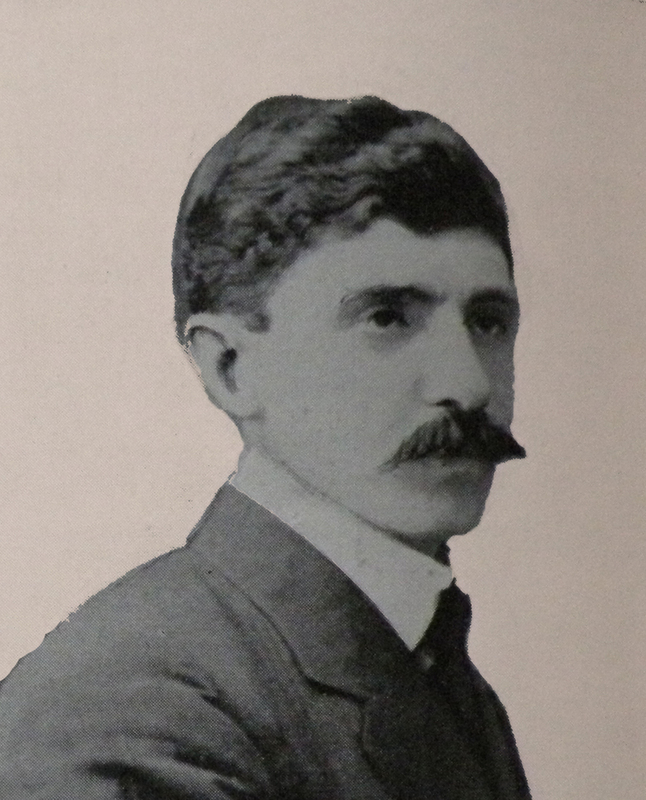 In 1880, the youngest brother, Manug, traveled to the United States to learn about the most recent advances in the industry. He settled in Worcester, Mass., where a community of Ottoman Armenian expats had created a community. There, he met with Dikran Terzian (Tertsagian), who had acquired vast expertise working in American foundries. 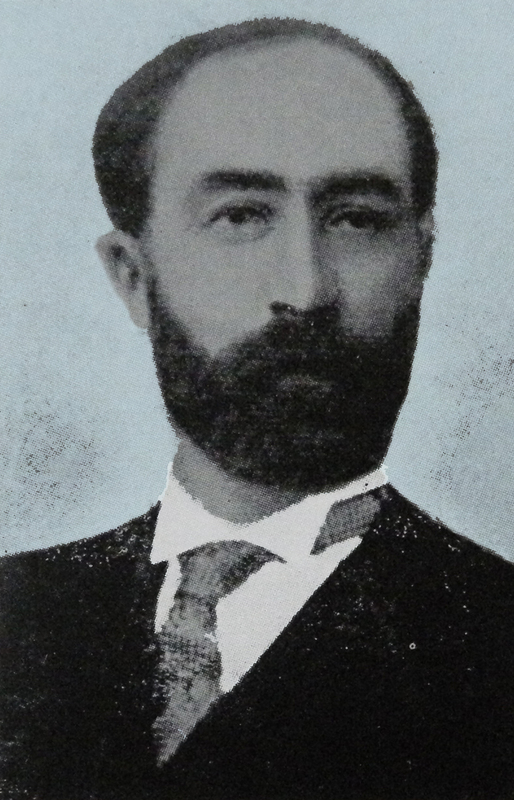 Manug established a close relationship with Dikran and convinced him to go to Harput and work in the Parigian factory. 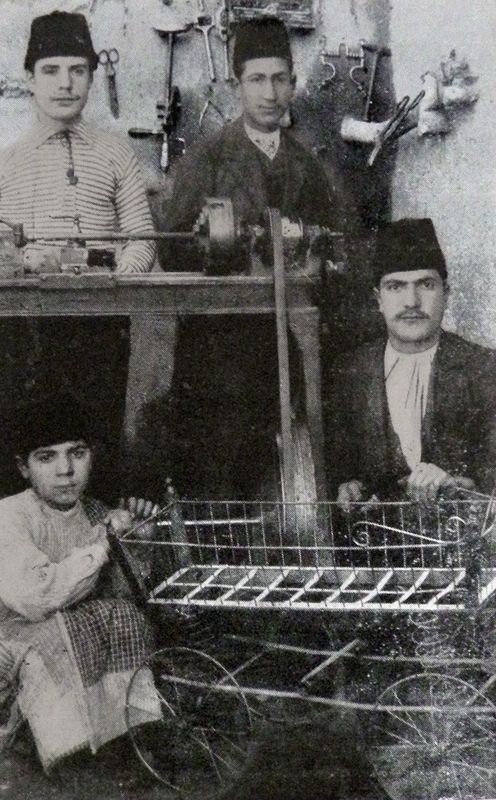 Soon enough, Dikran Terzian arrived in Harput, bringing with him modern tools and machines like lathes, shapers, drill presses, steam engines, and fans. Dikran’s arrival further invigorated the foundry: New forges were built; iron, copper, and brass began to flow abundantly and took different shapes in the foundry; and the production of agricultural tools increased exponentially. 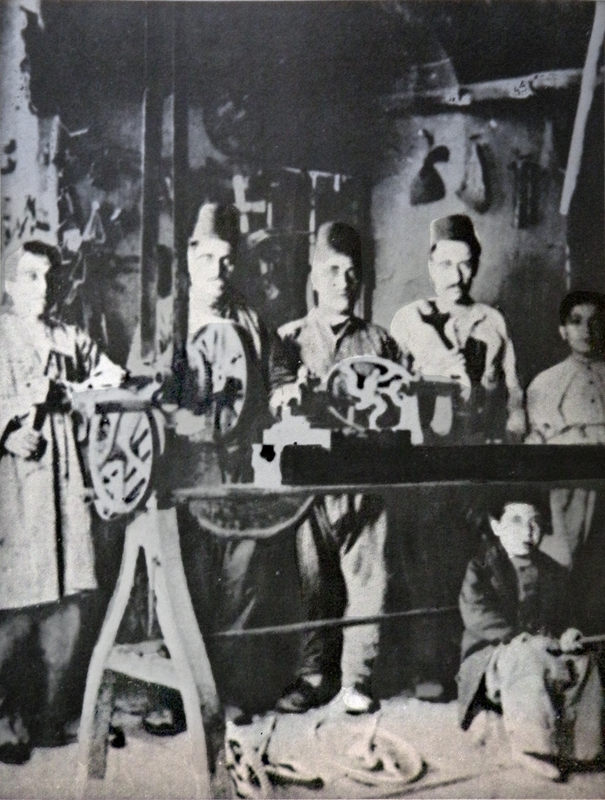 The Parigian brothers also repaired metallic machines in their factory, including meat grinders, sewing machines, and malfunctioning weapons for the Ottoman state. 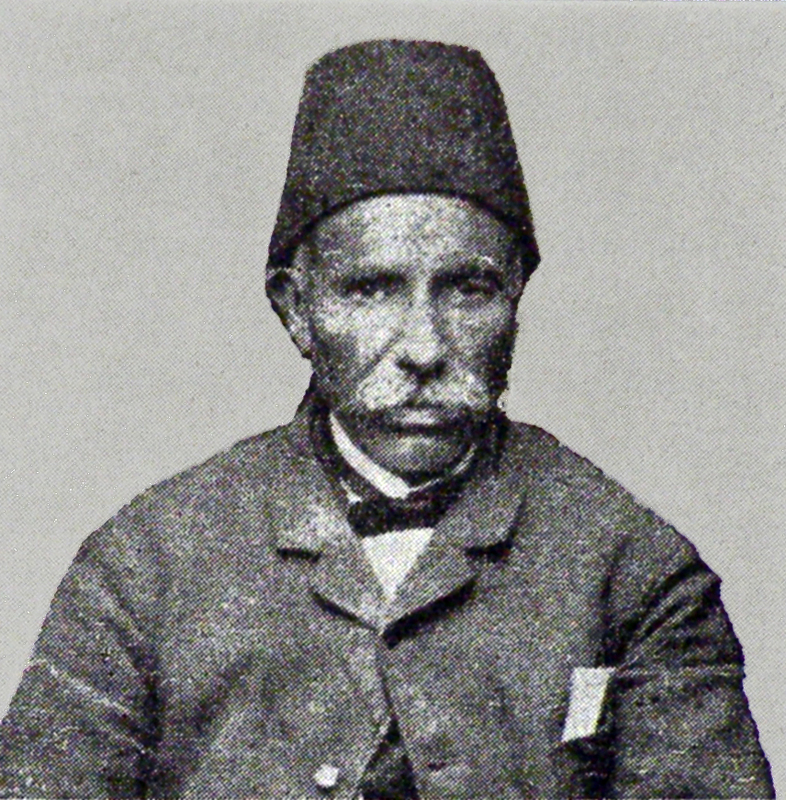 The Ottoman authorities increasingly approached the success of the factory with suspicion. After all, they thought, Apraham was both an Armenian and a former gunsmith—a combination that fueled the paranoia of the authorities. The police soon ordered the closing of the foundry alleging that weapons were being secretly manufactured there. The Parigians however had influential Turkish friends and, with the leveraging of their influence, the factory was reopened. But the suspicion remained. After some time, the accusations resurfaced, and the factory was shut down again. 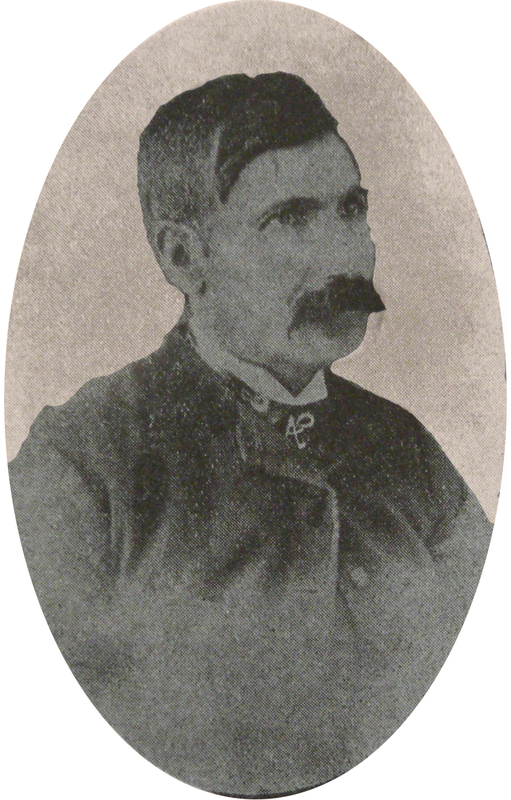 These circumstances prompted the chief figure in the foundry, Dikran Terzian, to leave Harput and return to the United States. But the Parigians did not give up easily. Bribery and leveraging of influence worked again, and the foundry was reopened. In no time, the brothers managed to restore the factory to its former production levels. Around this time, the youngest brother, Manug, returned from the United States armed with new knowledge. The factory was now in its heyday. In the village of Harput, this craft was a domestic endeavor, with each house having its own operation. Certain villages, like Hussenig, stood out for its master weavers, whose work was beautiful and of high quality. 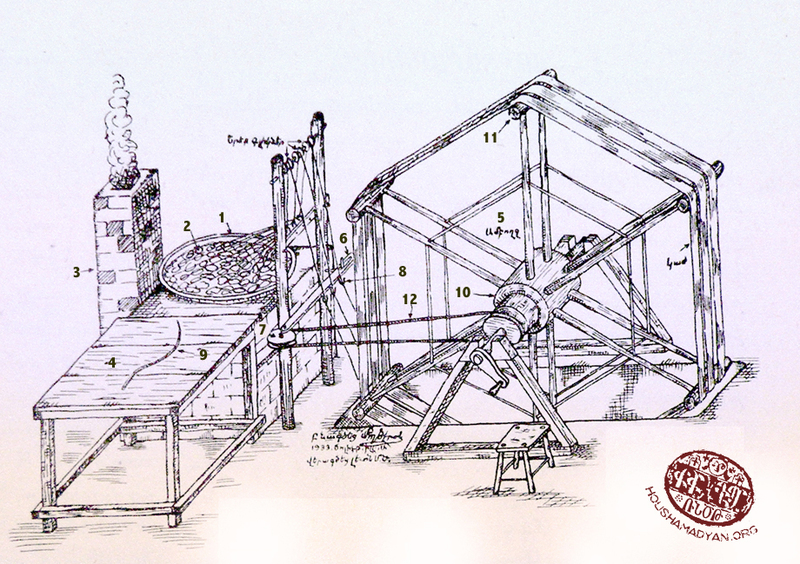 The village produced red and blue prints, as well as summer clothing for the Ottoman army . Harput’s asorots chit (chintz, printed multicolored cotton fabric with a glazed finish) was renowned and sold in remote Ottoman and other cities. It was produced domestically and the local Assyrian community excelled in it. After the weaving was completed, the product was taken to asorots chay (the Assyrians’ stream), which was in fact a valley. Here, the product was cooked and then hung to dry. Then, the process of coloring and printing pictures began. The coloring material was passed down from generation to generation throughout centuries by craftsmen who maintained the secrecy about its mode of preparation. It is known, however, that to prepare this red dye, rubia tinctorum (common madder), walnut crusts, gallnuts, and several herbs were used. 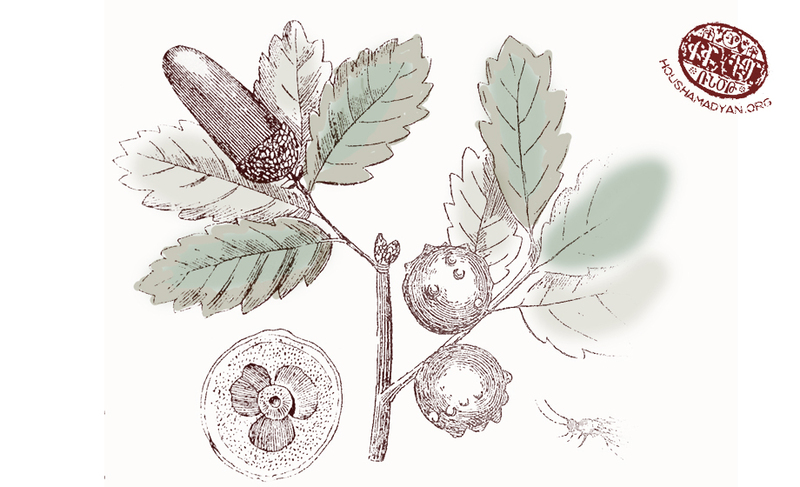 Gallnuts are produced by worms on several plants, and especially on the leaves of oak trees, and in turn produced a black dye used to, for example, prepare ink. Although in the early 20th century, alizarin came to replace this dye, it was not as durable. Manug Dzeron wrote in detail about tanning in the region. He wrote that first, a slush was made by mixing burnt clay in 20-25 kilograms of water and adding finely sifted oak ash. The slush was then applied to the rawhide. A day later, the remaining wool and hair was manually pulled from the rawhide. Then, the rawhide was folded and kept for a week, and water was periodically sprinkled on so that it wouldn’t dry out. The slush was applied a second time, and the rawhide was folded and kept for another week. The rawhide was then washed in the stream and placed in large vats, where a liquid called sakhkhad was added. This liquid was prepared by mixing dog manure to water. A day later, the cured hide was unfolded and the inner surface of the skin was thoroughly scraped to remove all remaining traces of meat. The water was then squeezed out from both sides. For the rawhide from cows and oxen, the procedure was the same, but it took longer. For example, the rawhide was treated with the slush for five to six days instead of one, and was kept in the vat for two weeks. The cured hide was then ready for tanning. The flour mills in Harput generally looked like the schematized drawing in the adjacent photo. The external structure is made of stone. The other walls are made of brick. The water-channel that brings the water diverted from nearby rivers is three feet (90 centimeters) wide, and 10-20 feet (3-6 meters) deep. At the edge of the water-channel are the sluice gates (called petag, beehive, in Armenian) that control the strength of the water stream. From here, the water floods over the waterwheel that starts turning. With the wheel, the shaft also begins to turn. At the end of the shaft is the runner stone. A lever (götürge in Turkish) was attached to the stone to control the degree of fineness of the flour that is being milled. 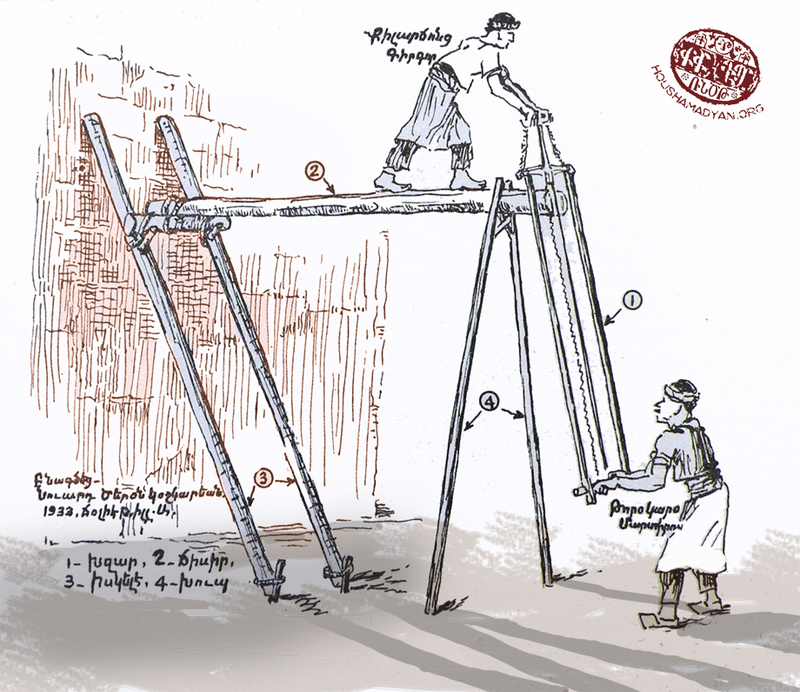 The waterwheel can be stopped in two ways: either by cutting the water-supply or lowering the lever all the way down. 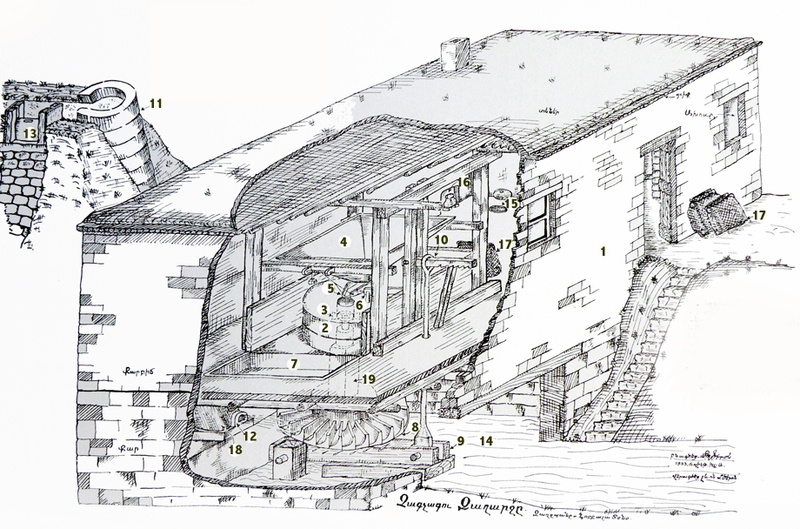 (1) mill; (2) millstone; (3) driver (garmudjag); (4) pail (takna); (5) spout; (6) chakhchakh; (7) flour store (alerdun); (8) waterwheel; (9) support post; (10) lever; (11) water channel; (12) nozzle; (13) sluice gate; (14) millrace; (15) oven; (16) hearth; (17) aghvon; (18) beehive; (19) wooden post. Sericulture, or silk farming, was introduced to the Harput plain in the 1860's. Parchandj stands out in this craft, particularly because mulberry trees abound in the village. Sericulture developed quickly in Parchandj, which soon became the hub of sericulture in the province of Mamuretül-aziz. It also developed and spread through Hussenig, Kesrig, Komk (currently Yenikapı), Morenig (currently Çatalçeşme), Hoghe, and Yegheki, where mulberry trees started being cultivated, and in the summer, hundreds of families turned their households into sericulture production centers. The speedy development of sericulture paved the way for the production of silk in the region. 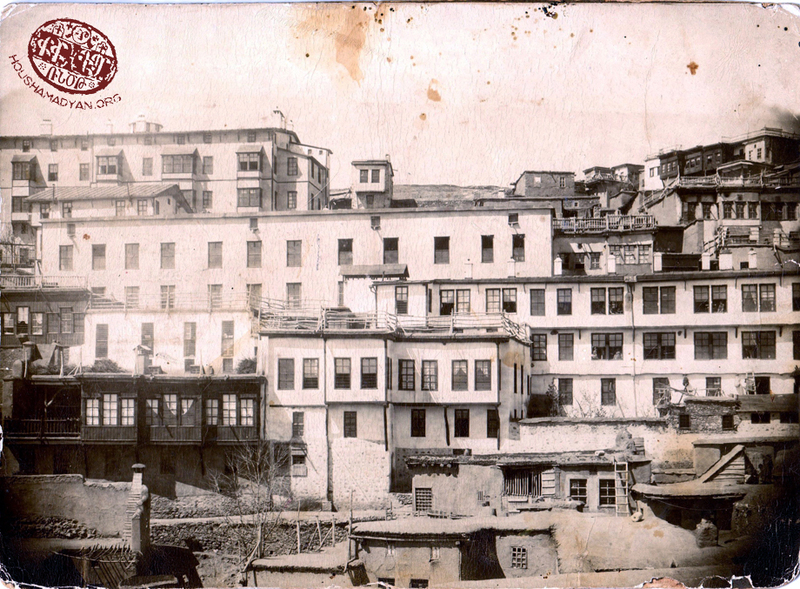 In no time, the production of silk became an industry in its own right in Harput and Mezire. 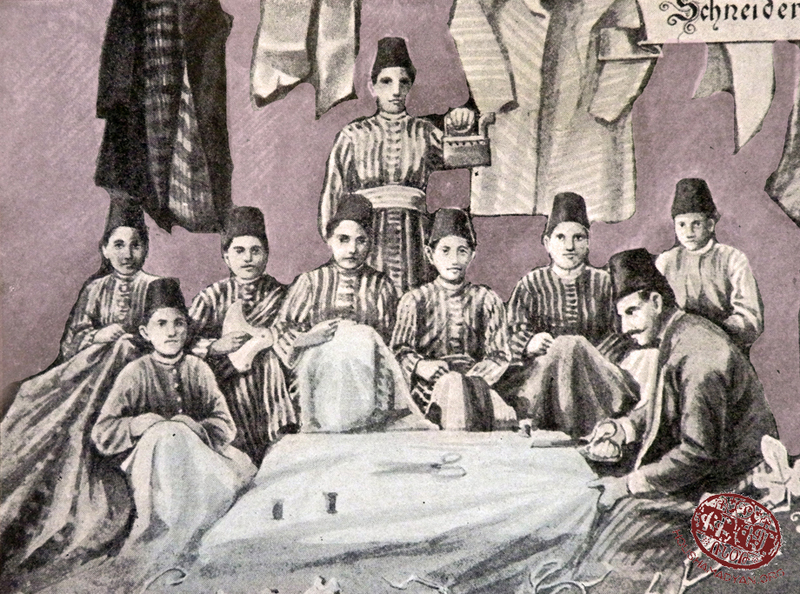 Silk production was spearheaded by two Armenian families: the Fabrikatorians and the Kurkdjians. Vahé Haig, Harput and its golden plain (in Armenian), New York, 1959, p. 654, 1016-1017; Manug B. Dzeron, Parchandj village: a complete history (1600-1937) (in Armenian), Boston, 1938, p. 223. Ibid., pp. 662-663, 673; Dzeron, op. cit., pp. 223-225; G. H. Aharonian (editor), Hussenig, Hairenik Publishing House, Boston, 1965, p. 83; Manug K. Djizmedjian, Kharpert and its sons (in Armenian), Fresno, 1955, p. 87. Dzeron, op. cit., p. 215. Aharonian, op. cit., pp. 81-82. Dzeron, op. cit., p. 214. Vahé Haig, op. cit., p. 797. The history of Habusi village (in Armenian), Baikar Publishing House, Boston, 1963, p. 48. Khup or khub in Armenian. It literally means lid, but in the local dialect, it simply means the support for the iskele. Dzeron, op. cit., pp. 216-217. These include the radam or aradam of the plough, which is the inner thick rod to which the metallic shaft is attached. Dofa. A wooden part of the weaver to which the weaving comb is attached. Dzeron, op. cit., p. 216. 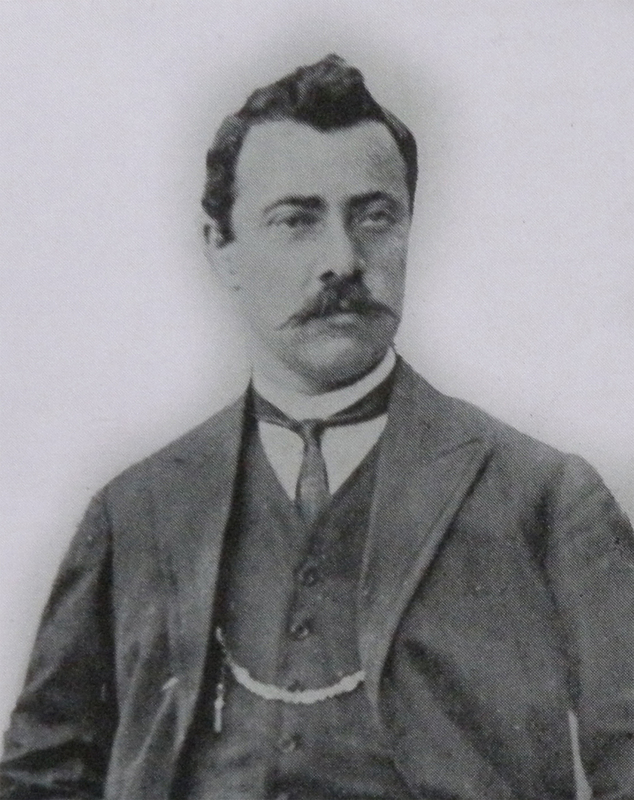 Vahé Haig, op. cit., pp. 663-664; Djizmedjian, op. cit., p. 88; Deranian, op. cit., p. 43. Vahé Haig, op. cit., pp. 644-648; Djizmedjian, op. cit., p. 90. Vahé Haig, op. cit., p. 666, 673; Djizmedjian, op. cit., pp. 87-88. Aharonian, op. cit., p. 85; Djizmedjian, op. cit., p. 91-92; Vahé Haig, op. cit., p. 798. Dzeron, op. cit., p. 224; Vahé Haig, op. cit., p. 666. 1 nugi = 0,5 okha, oka = 640 grams. Dzeron, op. cit., p. 224. Djizmedjian, op. cit., p. 88; Dzeron, op. cit., p. 224. Vahé Haig, op. cit., p. 666; Djizmedjian, op. cit., p. 89. Aharonian, op. cit., p. 84. Dzeron, op. cit., p. 226. Aharonian, op. cit., p. 84; Djizmedjian, op. cit., p. 72, 89. Vahé Haig, op. cit., pp. 668-669, 945; Djizmedjian, op. cit., p. 96. Aharonian, op. cit., pp. 82-83. 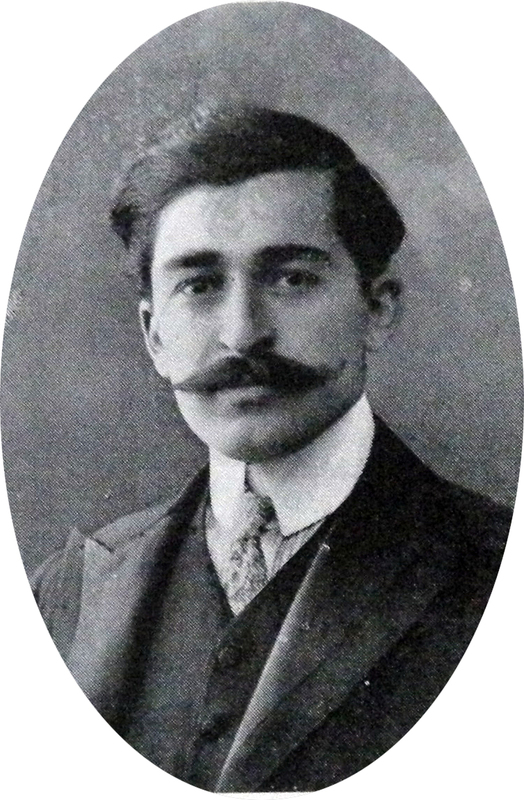 Abdal Koledj Boghosian, The comprehensive history of Pazmashen (in Armenian), Baikar Publishing House, 1930, pp. 101-102. Dzeron, op. cit., pp. 217-222; Vahé Haig, op. cit., p. 846. Vahé Haig, op. cit., p. 670. Ibid., pp. 670-671; Djizmedjian, op. cit., p. 89. Vahé Haig, op. cit., p. 774, 937. The history of Habusi village, op. cit., p. 52-53. Dzeron, op. cit., p. 212. Aharonian, op. cit., p. 84; Vahé Haig, op. cit., p. 639. Vahé Haig, op. cit., pp. 652-655. Dzeron, op. cit., p. 213. Vahé Haig, op. cit., pp. 641-643; Djizmedjian, op. cit., pp. 89-90. Vahé Haig, op. cit., pp. 649-652; Djizmedjian, op. cit., pp. 89-90. Aharonian, op. cit., p. 86; Djizmedjian, op. cit., p. 73; Vahé Haig, op. cit., pp. 673-674, 741. Boghosian, op. cit., pp. 29-30; Vahé Haig, op. cit., p. 843, 956; Djizmedjian, op. cit., p. 91. Aharonian, op. cit., p. 87. Vahé Haig, op. cit., pp. 671-672. Aharonian, op. cit., p. 86; Vahé Haig, op. cit., p. 670. Dzeron, op. cit., p. 222. Aharonian, op. cit., p. 83. The Ottoman journal Fünun ve sanayi (Science and industry) Istanbul, 1910. The picture artist is Hovsep.